Do you not say, ‘There are yet four months, then comes the harvest’? Look, I tell you, lift up your eyes, and see that the fields are white for harvest. Here’s an interesting fact about American church history that you may not know. Years ago, when the first New England churches were designed, they were built with clear windows rather than the stained glass ones we see so often today -- and the graveyard was usually built in the churchyard, which would normally be seen from the pulpit. Why? It was so that the pastor could see the graveyard while he preached and be reminded of the urgency of his message! It was so he could be reminded that everyone who sat in the pews before him as he spoke, would eventually fill a place in that cemetery outside the window and ultimately have to stand before God to be judged. Can you imagine? Back then, the first and foremost priority of the church was to bring men and women into a right relationship with the Lord. What’s happened to us that we’ve started building churches with windows you can’t see through!? There is a harvest outside! 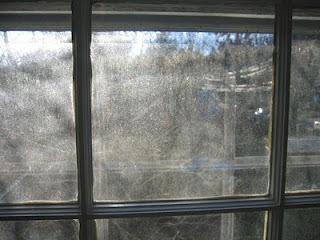 Let’s clean our windows so we can see the work that needs to be done! Let’s make a commitment to share the good news with someone today! Dear Lord, we pray that You would bring someone to us today that we can share Your Good News with. In the Name of Jesus, Amen. "In the name of Christ, STOP!!!" Be free from the shackles of the past. God does have a sense of humor. Allow your sins to be washed away. Are you willing to die for your faith?